Authentic sound delivered via the simplest interface. Handmade in Greece. Simple control layout. Authentic Uni-Vibe-like tones. Not the most advanced 'Vibe clone we've seen. We've seen quite a few Uni-Vibe-style pedals lately, including Korg's up-to-the- minute take on the original with totally redesigned circuitry. By contrast, JAM's take on the 'Vibe goes back to the original sound creation method of using four photocells surrounding a pulsating light source. "The pedal doesn't lack volume when kicked in and there's an internal trimmer (factory-set to max) to reduce the output"
You don't get the switchable vibrato and chorus modes or treadle-operated adjustment, but, between them, the depth and speed knobs provide plenty of variation. The pedal doesn't lack volume when kicked in and there's an internal trimmer (factory-set to max) to reduce the output. Another internal trim pot adjusts the maximum intensity. 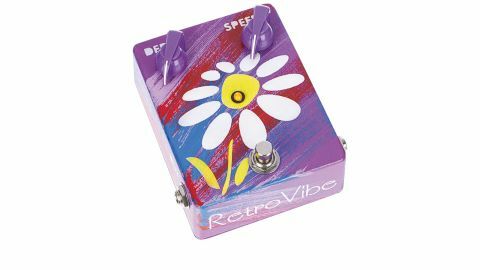 We'd like to resist the temptation to name-check Hendrix and Trower in a vibe review, but the RetroVibe will sound so familiar if you're a fan of either - not just the modulation but a gloopy reduction in the top end, too.